The Best Way to Keep a Man is to Let Him Go (among other things), by Joyce Fields. The author shares her experiences and observations, based on a 56-year relationship (46 years of marriage) with the same man–and the fire is STILL hot, hot, hot! Get this book to find out why she says that 80% of the success of a relationship rests on the shoulders of the woman! It’s also an excellent addition to a bridal shower gift! 64 pages, including 21 pages of DELICIOUS! family recipes (macaroni and cheese, tuna salad, chicken and dressing, beef stew, greens, dry beans, cabbage, cornbread, pot roast, skillet chicken and rice, pepper steak, mashed potatoes, lasagne, spaghetti, chili, apple pie, banana pudding, lemon cream pie, Aunt Yetty’s pound cake and more). Printed book is $9.99, plus shipping; eBook is $2.99. Hi, Moniek! Glad to see that you downloaded the book. Don’t forget to post your review!! Love you, too!! This book has been a great read for me! I just recently married and this book will serve as a great guide for years to come! The recipes in the back are easy to follow and delicious. I made the apple pie for my husband and he absolutely loved it! It’s because of you and Dee Dee that I wrote this book. I’m glad that it will be a great guide for you!! Also glad that James loved the apple pie!! While having an inside scoop, I have read this book carefully. I have not only laughed, paused in AWE, and tried the recipes to help me “Keep My Man!” Pap and Joyce are truly “ONE OF A KIND”…and the two shall be one. I recommend this book to my sisters and I have shared it with my six-teen year old to help aid her fair weathers relationships. This short-book should be Featured on the next Steve Harvey show, right next to TLLALM. Thank you Mrs. J for being the voice of the wise (older) lady in my life. Hi, Ms. Fields! I was one of the AT&T reps who assisted you during one of your calls to AT&T. I would really love to order the printed copy of The Best Way to Keep a Man is To Let Him Go to add on my collections of books.. But do you ship your books outside US too? Like to Philippines? While having an inside scoop, I have read this book carefully. I have not only laughed, paused in AWE, and tried the recipes to help me “Keep My Man!” Pap and Joyce are truly “ONE OF A KIND”…and the two shall be one. I recommend this book to my sisters and I have shared it with my six-teen year old to help aid her fair weathers relationships. This short-book should be Featured on the next Steve Harvey show, right next to TLLALM. La Madre Docena: Una receta fácil para recaudar fondos para niños! Mother’s Dozen: An Easy Recipe for Raising GREAT Kids! 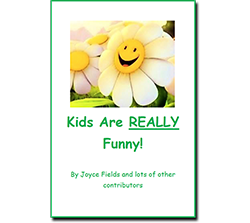 Use the form to the right to sign up and get a FREE DOWNLOAD of our eBook, "Kids Are REALLY Funny!"